At Boulevard’s planning group meeting and in other discussions with the public and press, Soitec has repeatedly promised it would make efforts to minimize environmental impacts and has stated that it would not scrape bare vast tracts for its projects. The company brochure makes simlar claims including "no grading of water required" and "minimal impact on vegetation and wildlife." 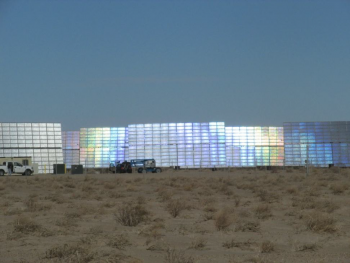 But the Newberry Springs project, which has the same sized Soitec solar modules proposed for Boulevard, proves otherwise, as numerous photos sent by CEQA-NOW shows. (photos, top left and right, for example). 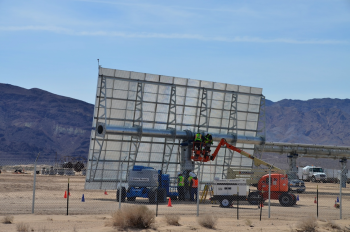 Residents contend that Soitec pulled a bait-and-switch tactic in Newberry Springs after acquiring the project site from another company that had proposed panels only about seven feet tall. The company assured community members that environmental impacts would be minimal. Residents report they were shocked to see the entire site bladed, every piece of vegetation removed along with the crust of desert soil, and modules 27 feet high erected which blocked views of the Newbery Mountains Wilderness area. Those facts are detailed in a letter sent February 28, 2014 by CEAQ-NOW to Tom Hudson, director of San Bernadino County’s Land Use Services Department. The letter further alleges that many if not all proposed mitigations “have somehow disappeared” including a living fence to screen visual impacts, soil stabilization to reduce blowing sand, and road improvements. The letter further asserts that Soitec’s permitting manager, Patrick Brown, stated that the company had not retained records including signed applications for any amended conditions of approval, nor signed approvals for amended conditions of approval – such as the massive change in height. Hutchens contends that "Soitec is in full compliance with County requirements" and objects to the bait and switch characterization. "That's not the case. 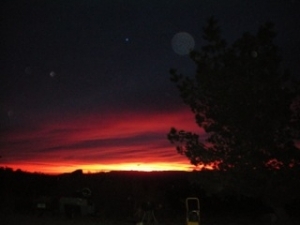 It was fully approved by the County and all of the community was public noticed," she states. Soitec later sent a statement reading, "Soitec is making efforts to minimize the environmental impacts of its projects as required by the California Environmental Quality Act and as discussed in the Draft PEIR. The brochure cited in the article is intended for a world-wide audience, subject to local permitting and development requirements. Here, the County of San Diego’s CEQA document is the authoritative document about the Boulevard projects, not the brochure, and Soitec has never made any representation to the contrary." She said the company has "no plans to build Phase II" in Newberry Springs. Interestingly, Soitec's representative Hutchens contacted ECM after this story ran and insisted that Brown never had anything to do with Soitec projects and in fact, left the County before Soitec's projects were even in the pipeline. But documents provided by Donna Tisdale prove that Hutchens' once again misrepresented the facts. "Attached are several documents that confirm Patrick Brown was working Soitec projects before his last day of County employment on March 1, 2012," Tisdale wrote in an email March 5 to ECM. Specifically, Tisdale elaborated, "Brown signed the County's pre-application letter summary letter for Soitec's Rugged Solar dated 8-25-11. Brown is listed as in attendance (as county planner) at the 10-25-11 County's pre-application scoping meeting on LanWest/East Rugged Solar. Several e-mails between myself and Patrick (Jan-Feb 2012) are cut and pasted into another attached document that further document that he was working on Soitec projects prior to leaving the County to go straight to work for Soitec." When ECM contacted Hutchens regarding Tisdale's documentation, Hutchens admitted that Brown was involved with projects in the early phases. "Patrick Brown did work on the pre-applications for Soitec, but as I shared with you, he left prior to the formal application being filed so he did not work on the actual applications," she stasted. "LanWest was submitted to the County while he was there, but it was not assigned to him." This is far from the first time that San Diego County has faced criticism over its revolving door policies. Other official bodies such as Congress impose moratoriums or a year or more before a county official can go to work for a company they oversaw, or vice versa. Back in 2006, this writer exposed in a story published at RawStory that a former Blackwater attorney, Lori Spar, went to work soon after leaving the firm to become an environmental planner with the County overseeing the Blackwater paramilitary training camp project proposed in Potrero. That report won a prize from San Diego Press Club. The County confirmed that it has no time limits to prevent such revolving door situations, creating fertile grounds for conflicts of interests. This is also not the first time that serious concerns have been raised over Soitec estimates of its projects’ impacts. The company’s environmental consulting firm, Dudek, has a troubled track record of severely underestimating water usage at various projects, notably the Eco-Substation in Boulevard that used three times more water than Dudek estimated, as ECM has reported. Local planners have exposed that Dudek’s estimated water use in the Soitec solar draft Environmental Impact Report for its four proposed Boulevard industrial solar projects (including site shown in photo, right) omitted concrete making operations and rock-crushing planned onsite, both very water intensive uses, among other items omitted. An SDSU hydrologist has said even the levels Soitec estimates could destroy the region's ecosystem, draining groundwater resources beyond the level that can be replenished, a joint investigation by ECM and Eco Report revealed. Cleveland National Forest Foundation and Anza Borrego Foundation have joined the fight against Soitec's projects, citing irreversible harm the projects could pose to the national forest and California's largest state park. Soitec opened a solar manufacturing facility in San Diego in December 2012 after receiving a $25 million grant from the U. S. Department of Energy to develop its manufacturing base here. The French-based company known for developing its flagship material, SOI (Silicon-on-Insulator.) Jean-Michel Lamure and André-Jacques Auberton-Hervé founded the company in 1992, collaborating on developing and commercializing their Smart Cut™ “atomic scalpel” technology. Soitec focuses on five industries: computing, telecommunications, automotive electronics, lighting, and solar energy. Initially, Soitec’s main focus was in the electronics industry. However, several years ago, Soitec launched into the solar energy industry. Currently, the company owns solar and wind energy facilities in France, the United States, Germany, Italy, Asia, China, Korea, Japan, Singapore, and Taiwan. In 2011, Soitec Solar Development, LLC, received the approval of five of its power purchase agreements with San Diego Gas and Electric (SDG&E) from the California Public Utilities Commission (CPUC). 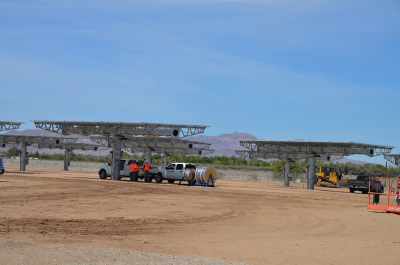 These five projects represent a combined capacity of 155megawatts (MW) of solar energy with electricity generated at solar power plant sites in San Diego County. While Supervisors have been supportive of Soitec efforts to create manufacturing jobs locally, the company’s efforts to deceive planners, public officials and residents about the real impacts of its first proposed projects in San Diego’s East County—and in Newberry Springs-- could give decision makers pause to examine the veracity of all claims made by Soitec. Voters may also question why County officials have not yet seen fit to end the County’s revolving door policy that allows planning officials to work for companies with projects before the County and vice versa-- a system that enables conflicts of interests and potentially, corruption. Public comments on the project are being accepted through March 3rd. For details on how to submit comments, see http://www.eastcountymagazine.org/node/14938. Note: this story was updated March 5, 2014 with clarifications provided by Soitec regarding an error in their original statement. Nice expose, Miriam. Thank you. Nothing about these companies--their bold, shameless deceit--surprises me. And as you write, it "should give decision makers pause." Something tells me, however, that it will not. Government and renewable energy industries have formed a unholy alliance. The first profits politically. Climate change hysteria has given politicians a chance to boost their popularity by hastily forming and then ramrodding through new "green" energy policies and mandates. These have created, in turn, vast new industries all too ready to capitalize on the arbitrary and heavily subsidized requirements. Together, they are nearly unstoppable--especially in the absence of a vigilant fourth estate and concerned, literate public. Not long ago you asked what would happen without newspapers and interested readers (THE DEMISE OF LOCAL MEDIA: WHAT IF WE SOON HAVE NO NEWSPAPERS LEFT? ECM, February 17, 2014 http://www.eastcountymagazine.org/node/14976. Projects like these, I fear, are the unhappy answer.